From Ancient Greece, comes a familiar mythical bird of prey, the Harpy. 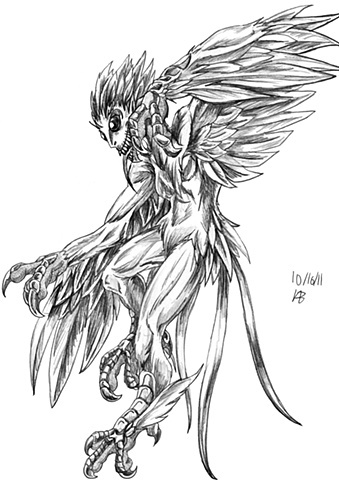 The Harpy is a bird woman monster that started off as the sisters of Iris, a rainbow Goddess, and daughters of Thaumus, a sea God, and Electra, a mortal woman . They were used as a punishment to Phineas, for foretelling too much information. He was forced to eat at a buffet that he can never taste as any attempts at eating are foiled by the Harpies snatching up his food or defecating on anything that's edible. This continued until Jason and the Argonauts put a stop to it without killing them at the request of Iris. The Harpies use as divine punishment gave them the depiction as Agents of Punishment who attack and torture souls on their way to Tarturus. They are depicted as violent wind elementals and horrible monsters that work in groups of three. Interesting enough, early depictions of the Harpies showed them as beautiful bird woman. The idea of being ugly bird woman was a later change as it prevented them from being confused as Sirens, who were also beautiful bird women. In designing the Harpy, all the elements were easy to do, due to extensive familiarity to Greek myths. The face was the easiest part to do, as I had the feathered head already in my mind when I drew it. The rest of the body came together, while I got my hand strained from detailing its taloned hands and feet. I strayed away from human features as I wanted the Harpy to look monstrous, like a humanoid Archaeopteryx instead of a bird with a human head.